uuid : 68c5cf68-e5a9-4d35-bc55-39df527c4a86 templates_id: 119564 templates_uuid: "f30a0085-361b-4717-bf20-4f7ea99e6ff0" title: "Shared parental leave | Shared parental leave policy" display_name: "Shared parental leave policy" meta_keywords: "Shared parental leave procedure" description: "
Notify staff and managers about the shared parental leave system. Shared parental leave entitles expectant parents, or parents adopting a child to share the caring responsibilities depending on their preferences and circumstances. This document gives parents or guardians a sense of flexibility at work without being penalised. This shared parental leave policy covers the parents eligibility, their notification requirements, as well as shared parental pay. Ensure that your staff know when shared parental leave can be taken as well as when they have to return to work after leave. Use this shared parental leave policy to inform staff and managers of their responsibilities during this process. Note that this is not the parental leave policy. Shared parental leave (SPL) is a new legal entitlement for eligible parents of babies due, or children placed for adoption, on or after 5 April 2015. It enables an eligible mother to exchange her maternity allowance for SPL. SPL allows for eligible parents to choose how to share time off work after their child is born and allows for a more flexible arrangement. Why do I need a SPL policy? A SPL policy ensures that your staff are up-to-date on when shared parental leave can be taken as well the notification requirements. It ensures consistency when making and responding to notifications from employees regarding SPL. To qualify for SPL, you must share responsibility for the child with either your husband, wife, civil partner or joint adopter, the child\'s other parent or your partner if they live with you and the child. The mother must also be entitled to maternity/adoption leave; or to statutory maternity/adoption pay and have given notice to reduce her allowance in exchange for SPL. The parent who intends to take SPL must also be an employee, share the primary responsibility for the child and have properly notified their employer of their entitlement. The individual must have worked for the same employer for at least 26 weeks at the end for the 15th week before the child\'s expected due date and is staying with the same employer whilst you take SPL. In the 66 weeks leading up to the baby\'s expected due date, the individual must have worked for at least 26 weeks and earned an average of \302\24330 a week in any 13 weeks. 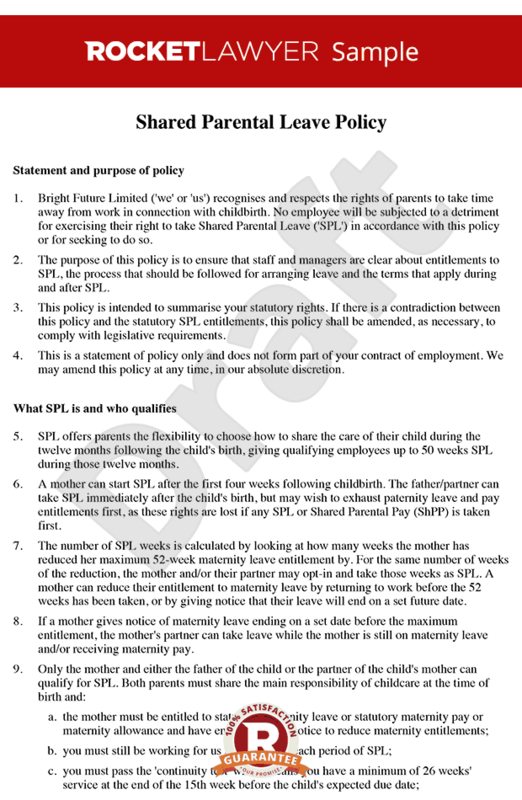 SPL can be taken at any time from the end of the two week compulsory maternity leave period (which increases to four weeks for factory workers) up until 52 weeks from the date of birth (ie up until the child\'s first birthday). How much SPL can be taken? This would depend on how much leave the mother has reduced from her 52 week maternity leave (The first two weeks must be taken as maternity leave). A mother can create up to 50 weeks\' worth of SPL. When must an employee submit a notification to take SPL? A notice to book SPL must be submitted at least eight weeks before any period of leave would begin. A notice must be in writing, dated and clearly set out what leave the employee intends to take. How should SPL be taken? SPL must be taken in weekly blocks and can be taken in a single block or in separate blocks if agreed by the employer. An employee can make at least three requests to book or vary SPL but must notify their employer of their right and book the leave with at least eight weeks\302\222 notice. SPLIT days enable each parent to work up to 20 days whilst taking SPL. They are optional and must be agreed upon by the employee and employer. What happens if a parent changes their mind about opting-in to SPL? What\'s the statutory shared parental pay (ShPP)? The statutory ShPP is available if an employee meets all the eligibility criteria. A mother (including an adoptive or surrogate mother with parental responsibility for the child) must be entitled to 39 weeks of statutory maternity pay (SMP), statutory adoption pay (SAP) or maternity allowance (MA) and must reduce the number of weeks she is paid SMP, SAP or MA. This means the maximum ShPP a father or partner of the mother can take is 37 weeks while taking SPL. ShPP is the lower of 90% of an employee\'s pay and the minimum rate set by the Government each tax year (\302\243140.98 a week as of 1st April 2017). An employee will only qualify for ShPP if he or she qualifies for SPL. Should I offer enhanced ShPP? Although there is no need to offer an enhanced ShPP, many employers consider company ShPP a valuable part of their benefits package. It can help attract and retain good employees and boosts staff morale and loyalty. Do I have to offer enhanced shared parental pay if I offer enhanced maternity pay? Employers do not have to offer enhanced ShPP if they offer contractual maternity pay, however, if the employer does offer enhanced ShPP it must be offered to male and female employees who take SPL. What happens when the employee returns to work? The employee is entitled to return to the exact same job on the same terms and conditions that they were doing immediately before they took SPL. You must not subject your employee to discriminatory or unfair treatment. This shared parental leave policy is governed by the law of England and Wales.
" created_timestamp: "2018-10-08 04:36:58.0" modified_timestamp: "2018-10-08 04:36:58.0" active: true created_by: 236 modified_by: 236 dcm_id: 342 url_slug: "Shared-parental-leave-policy" meta_description: "Use Rocket Lawyer\'s shared parental leave policy to clarify statutory rights. This draft outlines who can take shared parental leave and when it can be taken." time_to_complete: "10 minutes"
To qualify for SPL, you must share responsibility for the child with either your husband, wife, civil partner or joint adopter, the child's other parent or your partner if they live with you and the child. The mother must also be entitled to maternity/adoption leave; or to statutory maternity/adoption pay and have given notice to reduce her allowance in exchange for SPL. The parent who intends to take SPL must also be an employee, share the primary responsibility for the child and have properly notified their employer of their entitlement. The individual must have worked for the same employer for at least 26 weeks at the end for the 15th week before the child's expected due date and is staying with the same employer whilst you take SPL. In the 66 weeks leading up to the baby's expected due date, the individual must have worked for at least 26 weeks and earned an average of £30 a week in any 13 weeks. SPL can be taken at any time from the end of the two week compulsory maternity leave period (which increases to four weeks for factory workers) up until 52 weeks from the date of birth (ie up until the child's first birthday). This would depend on how much leave the mother has reduced from her 52 week maternity leave (The first two weeks must be taken as maternity leave). A mother can create up to 50 weeks' worth of SPL. SPL must be taken in weekly blocks and can be taken in a single block or in separate blocks if agreed by the employer. An employee can make at least three requests to book or vary SPL but must notify their employer of their right and book the leave with at least eight weeks notice. What's the statutory shared parental pay (ShPP)? The statutory ShPP is available if an employee meets all the eligibility criteria. A mother (including an adoptive or surrogate mother with parental responsibility for the child) must be entitled to 39 weeks of statutory maternity pay (SMP), statutory adoption pay (SAP) or maternity allowance (MA) and must reduce the number of weeks she is paid SMP, SAP or MA. This means the maximum ShPP a father or partner of the mother can take is 37 weeks while taking SPL. ShPP is the lower of 90% of an employee's pay and the minimum rate set by the Government each tax year (£140.98 a week as of 1st April 2017). An employee will only qualify for ShPP if he or she qualifies for SPL. More than just a Shared parental leave policy template, our step-by-step interview and guidance makes it easy to create your document. Easily create online, download, print and sign your free Shared parental leave policy in minutes. This document is also sometimes called: Shared parental leave procedure.